In 2009, with sales tripling in less than a year, Two Beers Brewing Co. moved its full operation from a tiny spot in Seattle’s Fremont neighborhood into a 2,400 sq. ft. South Seattle neighborhood brewery and tasting room, adding three 250-gallon tanks, one 1,000-gallon tank and a cellar. Tacoman Eric Willard, who worked across the street at Tiny’s Organic, wandered over to Two Beers and begins friendship with owner Joel VandenBrink. Willard would often push aside his pint of beer and help wash pint glasses and fill kegs, when he wasn’t experimenting with apple fermentation at Tiny’s. He would deliver Two Beers kegs to Tacoma taverns on his way home. VandenBrink eventually hired Willard to help with operations at Two Beers; exponential growth led to Willard’s move into sales. In the spring of 2103, VandenBrink founded Seattle Cider Company, which was right up Willard’s alley. Willard dove into cider making, helping create the original recipes. Today, Willard is an executive at Two Beers and Seattle Cider, in charge of so many things nobody can pinpoint his exact job. In conjunction with our SudsPop event with Willard and musician Kim Archer tonight, Peaks and Pints presents a flight of Willard’s wizardry, Craft Beer Crosscut 11.14.18: A Flight of Seattle Cider and Two Beers. One of Washington’s oldest fruits is showcased in this single-varietal beauty. Aged in Syrah red wine barrels, small Naches Valley Winesap apples are both aromatic and tart, offering a beautiful full-bodied cider. Seattle Cider coaxed aroma of cherries, apples, raspberries, strawberry and a light pleasing tartness. This cider has a medium smooth body with a light amount of carbonation. The taste has crisp apples, dry berries, oak, and is drier than the aroma. The finish is fairly woody. 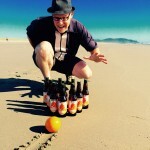 Seattle Cider releases its Washington-grown fruit, six-month aged Harvest Series every autumn. The Heirloom harvest includes slightly tannic Cortlands, tart Newtown Pippins and fragrant Winesaps, creating this elegant, modern cider. The flagship of the Harvest Series, this year’s offering brings tropical flavors with notes of citrus. When it comes to cheap winter fun, few activities match the thrill of gliding down a good hill. All that is needed? A toboggan, decent snow, and the stamina to keep climbing back to the top. 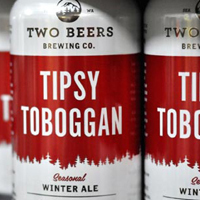 So, no snow but we’re in for climbing back on the Toboggan — Two Beers Tipsy Toboggan. A dark and toasty warming winter ale, Tipsy Toboggan offers notes of chocolate, date, plum and orange with a dash of hops. The deep dark color and full flavored finish pair perfectly with outdoor adventures. VandenBrink hiked the 93-mile trail circumnavigating Mount Rainier solo. He dreamed of above 80 International Bitterness Units while hiking through Mystic Camp at 5,570 feet. He believed he could push an IPA close to the alcohol by volume mark of a double IPA as he trudged along the South Mowich River. He drew inspiration mixing strong citrus flavor hops with hops boasting earthy, pine characteristics while traversing along a ridge to Devil’s Dream Camp. 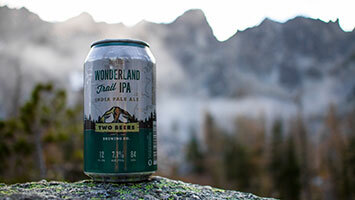 Wonderland Trail IPA is the product of nearly two years of recipe development. Featuring a seamless blend of Washington-grown hops, this flavorful Northwest-style IPA is brewed with Cascade, Amarillo, Mosaic and Legacy hops, then dry hopped with Citra and Mosaic hops, complemented by 2-Row, Vienna and Munich malts. On the nose, a slightly sweet aroma of tangerine is followed by a wave of citrus and passion fruit on the palate, finishing clean and refreshing.